Living with Parkinson’s can be a daunting task. Difficulties can begin from the time you’re diagnosed to the presence of daily obstacles associated with the disease. Take charge of your life with Parkinson’s. Below are some strategies that may help. 1. The most important thing is to maintain your nutrition and medication regimen. Make sure that you take your medications as directed by your physician and on time. Complying with your medication schedule is key to avoid “off” periods. 2. Perform daily exercise to help you manage your symptoms i.e. yoga, tai chi, meditation, painting, etc. 3. Get involved in a Parkinson’s support group to help you cope with a new diagnosis and adapt to the day-to-day realities of Parkinson’s. You can get support from fellow PD patients. You may also want to stay up to date on clinical care and research. 4. Parkinson’s disease, if well managed, should not interfere with your independence. It is helpful to have people in your life you can trust if you ever need assistance regarding your illness. The e-pill Parkinson’s medical alert bracelet can also help others aid you in times of emergencies. 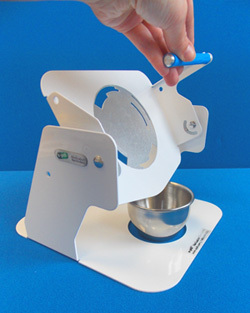 The e-pill tipper allows to easily receive medication from your automatic pill dispenser. This product is great for people with compromised dexterity. Get excited! There is now a discreet and stylish way to take your medication and vitamins with you. 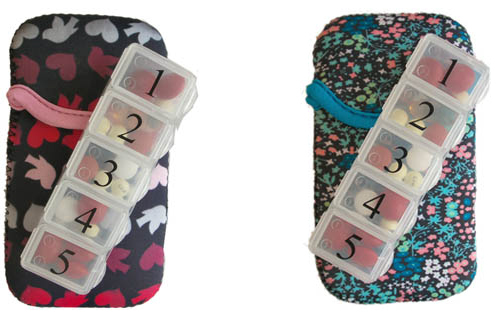 This is a fun and attractive way to organize your pills. The e-pill Purse is available in multiple eye-catching designs. The neoprene fabric is soft to the touch and flexible. The fabric pouch combined with the compact size gives one the convenience of storing your medication in a variety of compartments. The e-pill Purse can fit in many sizes of purses, large pockets, backpacks, and other carrying devices. Within the pill purse is a plastic 5 per day pillbox. The pillbox is able to fit large pills/capsules. This pillbox will protect your medication from moisture while the neoprene pill purse protects your medication from light. No one has to know you are traveling with medication. Check out the product on Amazon!